Lighting by Hammerworks handcrafted Colonial Style Hanging Lantern Coach H105A adds a touch of elegance and refinement to your front entry. Especially relevant we also make these classic six sided Colonial Hanging Lights in a larger size, Model H105. Of course no matter which size you choose expect superior craftsmanship, attention to detail and historical accuracy. Most importantly we make each hanging lantern out of solid copper or brass. Furthermore we offer Custom Finish Options of painted black and verdigris copper upon request. In addition you can choose from the attractive optional 3 candle cluster as shown or a standard single bulb shining down. Either option provides ample illumination. If you want to create an appearance of elegant harmony we make it easy. We offer the matching New England Style Colonial Post Lantern Large Coach P105 in two sizes for your front walkway. In addition New England Traditional Wall Lantern Small Coach WM105A completes the look. 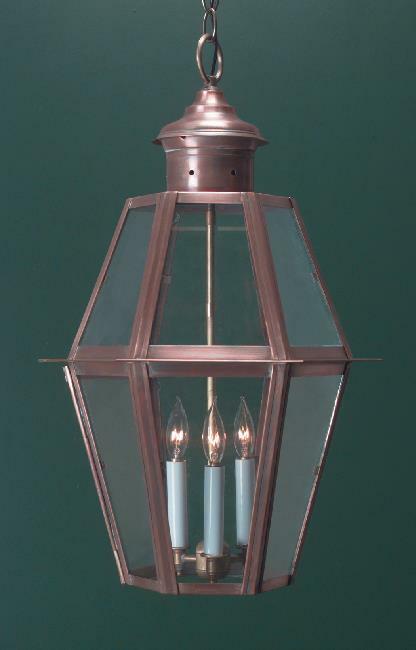 In contrast, if you prefer rustic simplicity consider Hanging Copper Colonial Lantern Pyramid HP119. 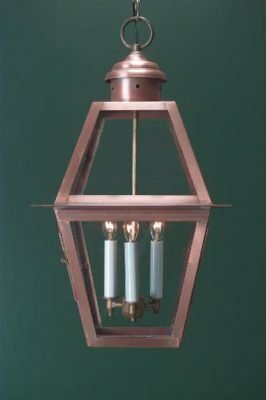 Of course we also offer the matching Colonial Home Copper Wall Light Pyramid W118 and Cape Cod Copper Post Lanterns Pyramid PP119 to complete the overall effect of this primitive look. Although Colonial Hanging Lights are primarily intended for the exterior of your home their uses extend to many inside areas. First of all, many customers choose to place something like the Colonial Pendant Light H112 in the front hallway entry. 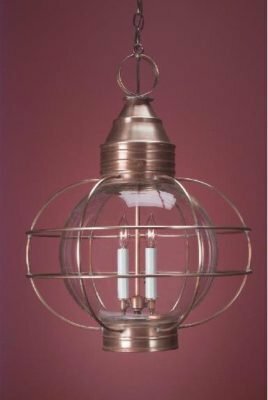 Not only that Colonial Hanging Copper Lantern Williams HW104 is an attractive alternative in a dining area. Or perhaps you can group together 2 or 3 Copper Hanging Onion Lights HOL110 over a kitchen counter or island. 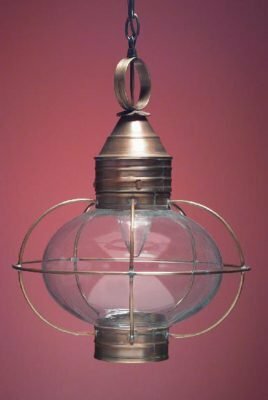 No matter what with so many sizes and styles to choose from it is easy integrate any Colonial Style Hanging Lantern throughout a kitchen, dining, great room area. Consequently we offer a solution to any area in your home requiring overhead lighting.